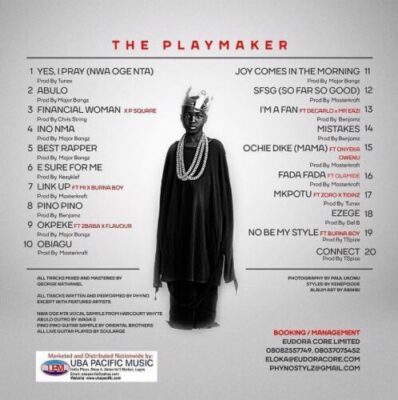 Prolific rapper, Azubuike Chibuzo Nelson, better known by his stage name, Phyno, has released his sophomore album titled “The Playmaker”. The 20-track album also enlists A-list artistes like Onyeka Owenu, 2Baba (2Face Idibia), Psquare, Burna Boy, Olamide, Flavour, etc. Production credit goes to the usual suspects, Major Bangz, Masterkraft, Kezyklef, Tspice, and Del’B. The album mixed and mastered by George Nathaniel.